Crafting With Lea & Sacha (UK/NL) - Come and join the fun! Everyone who’s known me for some time now will know I met my very best friend Sacha van de Kerkhof from http://www.stampinsacha.com/ through Stampin’ Up!. Since meeting we’ve become inseparable even if Sacha lives in the Netherlands and I live in the UK. Definitely one of the beautiful things Stampin’ Up! has brought me! 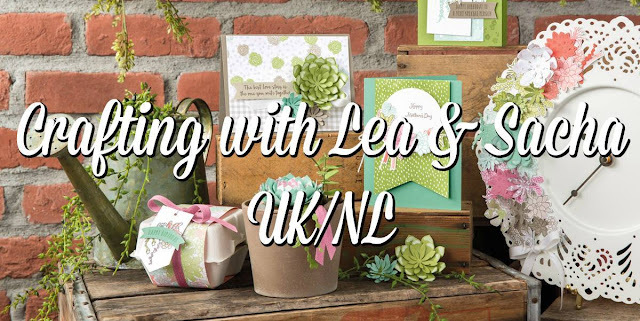 Sacha and I have created a Facebook Group called Crafting with Lea & Sacha UK/NL for all crafters to come together and enjoy each other’s creations. Everyone is welcome on our group whether you use Stampin’ Up! products or not…. any brand of products are welcome! Basically it’s a brilliant forum and group for all creative people! The purpose of our group is for everyone to get lots of inspiration, crafting tips, ask questions and we also do some great challenges, offers and news from the world of Stampin’ Up! The group is in English as well as Dutch, but you can chat away in your own language, after all, that’s what the translate option is for! Of course, the saying ‘the more the merrier’ is very true! That’s why I’m writing this post today to invite you all to join our group. All you need to do to join is click this link: https://www.facebook.com/groups/craftingwithleaandsachauknl/. As soon as either Sacha or myself see your request, we will approve you and you can begin to join in with all the fun activities! Maybe you know someone else who would also like to join our group? If you do, of course you can add them too. As soon as we reach 300 members we’ll have a great giveaway and when we reach 750 members…. A BUMPER GIVEAWAY! So what are you waiting for, come and join us and invite your friends to the party too! Hopefully we’ll see you soon in our group! If you fancy a schmooze through my shop just CLICK HERE TO SHOP ONLINE NOW. Please do remember that if your order is less than £150 to use this month’s Hostess Code which you will find at the top right of my blog below the tab navigation bar and at the bottom of each post. At the end of each month I add up all the Hostess Codes that have been used, convert them to Stampin’ Rewards and divide this between everyone that has ordered for that month….. which means….. YOU will receive a little something lovely through the post at the beginning of the following month but ONLY if you've used the Hostess Code. If your order is over £150 please don't use the code to make sure all the Stampin’ Rewards come directly to you (only individual orders in excess of £150 qualify for Stampin’ Rewards). Unsure what to do or need help ordering? Click HERE or give me a shout and I'll help you out :) I love to hear what you think of my projects so please feel free to leave me a message in the comments section below.